Brewed with Pilsner malt, oat malt, wheat malt, and special aromatic malt, and hopped in the whirlpool with Huell Melon, Vic Secret, and Azacca hops. We fermented warm with a blend of different brettanomyces yeast strains, and near the end of fermentation added glucoamylase, an enzyme capable of breaking down complex sugars into more fermentable sugars — essentially giving the yeast more to eat, and making the beer dry as a bone. After fermentation, we conditioned this beer on a whopping 400lbs of blueberry puree, and dry hopped it aggressively with Azacca, Huell Melon, Vic Secret, and Galaxy hops. Finally, we carbonated it quite high to really let the hop and fruit character shine and let the dryness be even more apparent. 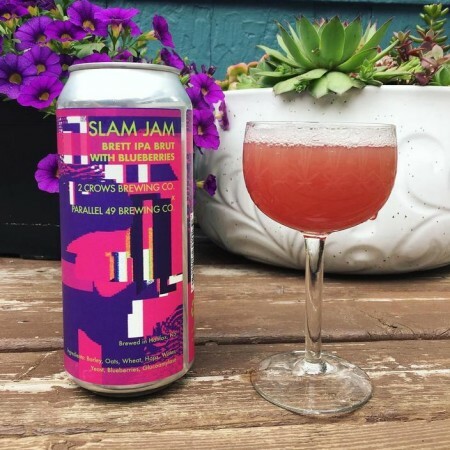 Slam Jam will be released at 12:00 noon today in a limited run of 473 ml cans available exclusively at the 2 Crows retail store while supplies last.